SinoDrink was established in 2008 by Edward Liu, the founder and the CEO of the company. As a member of Generali, the 2nd largest insurance company in the world, SinoDrink is the most comprehensive and professional Italian wine importer in China. We are also specialized in wine investment, wine event organization, fine wine collection and winery tour. Thanks to the support and the cooperation from our customers and partners, SinoDrink is ten years old in 2018. For ten years, SinoDrink has been dedicated to the promotion of Italian wines and lifestyles. We are now the leader of Italian wine importers in China and the most professional Italian wine supply chain operator. Having more than 50 suppliers, we are exclusive distributor for over 400 Italian fine wines from 20 regions all over the Italy. 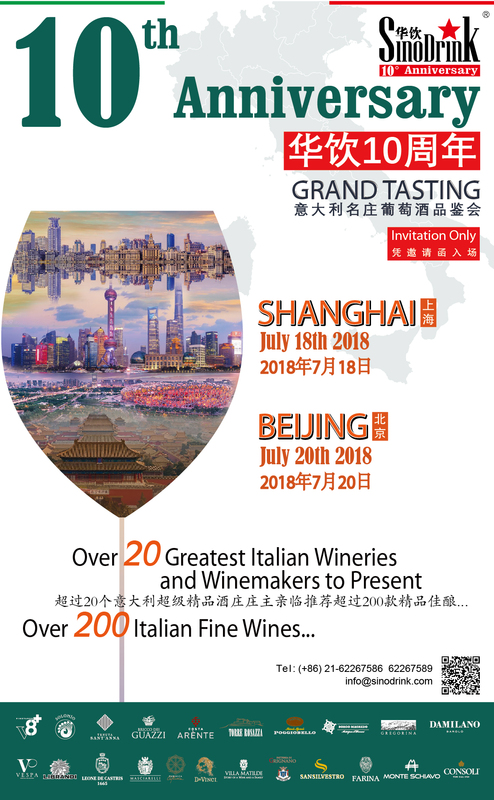 SinoDrink will hold the 10th anniversary celebration and grand tasting in Shanghai and Beijing respectively to give thanks. The representatives from over 20 famous Italian wineries will also attend this ceremony with nearly 200 fine wines and share their winemaking philosophy and unique terroir to the guests.